On this brand new section of our website you will find a selection of different stamp varieties which have been proven to be very popular amongst dedicated and the serious collectors. All the listed stamps are been sold in collaboration with highly reputable stamp dealers. 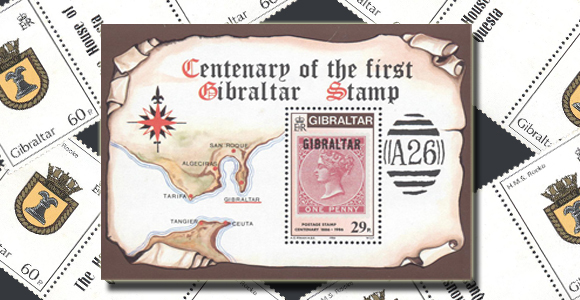 We guarante the condition and description of the listed stamps and although we are working in cooperation with professional dealers with a proven track record the stamps will be sent direct from the Gibraltar Philatelic Bureau offices and if the items are not to your liking when received we have a 45 day return policy in which a full refund is given to you. Stocks are limited, and in most cases we only have in our stock one of each item so please make sure to order promptly and visit this section regularly. We sincerely hope you find something of interest to add to your prized collection of Gibraltar stamps.